While we are a successful school, we are not complacent and strive relentlessly to show continuous improvement in our academic results. In the Summer of 2018, our school made exceptional progress and attainment was high for the third successive academic year. Ofsted consider a school’s results over a three year period, using a range of Performance Indicators. Below are the key performance indicators for 2018. In the Secondary Phase, the majority of subjects faced the new rigours of linear courses and the movement of grades to the 1-9 scale. In spite of this, our results are very positive, especially when viewed in the national picture of results this summer. Given the early stage in the school year, the final national figures for some performance indicators are yet to be released. We will update them as soon as the final figures are available. Three from Science, Computer Science, Geography, History and Modern Foreign Languages. Three from a list of eligible subjects, some of which are academic, others vocational. 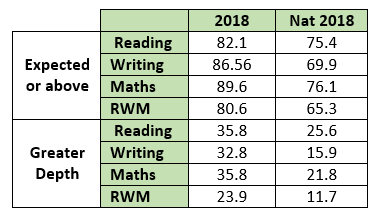 Students’ progress is measured against their scores in English and Maths in the KS2 tests. 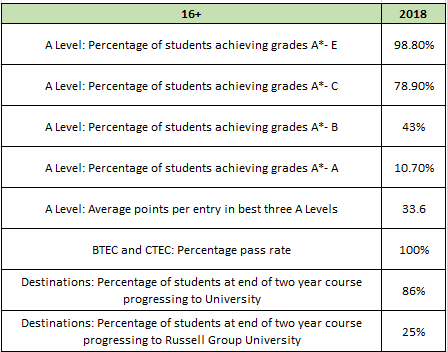 Students are given a target based on these results, predicting their GCSE Grades. If students attain these predicted grades, they score 0. A plus score therefore indicates that a student performed better than could be expected whereas a minus score indicates a student performed less well than could be expected. The school’s Progress 8 is an average of these scores.